Sunderland boss Jack Ross has believes Will Grigg should be fine to make his Black Cats debut at Oxford this weekend. 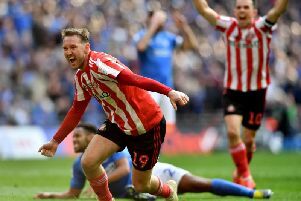 The 27-year-old striker moved to Wearside from Wigan on transfer deadline day but hasn’t played in recent weeks after picking up an ankle injury last month. “He should be fine to travel,” said Ross when asked about Grigg’s fitness levels.“He trained the majority of the session on Tuesday, he trained all of the season so unless there’s and adverse reaction general fitness he’s fine. “Like Grant (Leadbitter), like Lewis (Morgan) he’s not played a lot this season and there’s two sides to that. Lee Cattermole aside, Sunderland will travel to Oxford with few injury concerns, meaning there will be competition for places this weekend. “It’s the healthiest we’ve been as a squad, there’s not been that many cases like that this season. “There are one or two cases where we’ve had a full squad but we’ve always carried injuries so there’s the absolute competition for places at the moment which is what you want. “I think players understand they have to be at it all the time in training and have a performance level in games which keeps them in the team. “What it will allow us to do is be a bit more flexible in our approach to games.